Another of my articles on Sharpspixley.com emphasising the reduction in importance of Hong Kong as a conduit for gold flows into mainland China. The latest gold export figures from Switzerland demonstrate this well. For many year gold flows through Hong Kong were considered a proxy for those into China at which time ups and downs in the Hong Kong figures were indeed significant – but the Territory has for several years now been of diminishing importance in this respect but still some of the media considers them as the proxy for ups and downs in Chinese demand. Such articles should thus be ignored as not presenting the true picture. Perhaps then biggest surprise was the enormous fall in gold exports to Hong Kong in the Ausuts Swiss gold export figures. The Chinese semi-autonomous administrative state imported only 3.4 tonnes of gold from Switzerland in August demonstrating in no uncertain terms that the Territory is being sidelined as an import routing for mainland Chinese gold imports in favour of mainland ports of entry like Beijing and Shanghai. Hong Kong gold imports can definitely no longer be considered a proxy for Chinese gold demand as we have been saying for some time, although global media still gives undue importance to the level of Hong Kong gold imports and to the Territory’s exposts to the Chinese mainland. Mainland China was again the biggest recipient of Swiss gold in August at 45.2 tonnes, closely followed by India with 40 tonnes (see chart from Nick Laird’s www.goldchartsrus.com website below. ), suggesting that gold demand in the two biggest gold consumers is holding up reasonably well, but perhaps the biggest surprises were the big rise in Swiss gold exports to Singapore (12.6 tonnes) and even more so Thailand (21.6 tonnes). Interestingly Turkey apparently imported no gold at all from Switzerland in August, but actually exported 12.8 tonnes to the small European nation at the centre of the global gold refining trade. As usual, the Swiss figures show an ever-continuing flow of gold from West to East with Asia and the Middle East accounting for over 88% of the total export figures…..
HK to China gold exports way down; SGE gold withdrawals way up. What gives? As can be seen from the excellent chart from www.bullionstar.com below, we are seeing quite a divergence in statistics between Shanghai Gold Exchange (SGE) gold withdrawals so far this year and gold exports to mainland China from Hong Kong, which used to be seen as a proxy for total Chinese imports, but should now be discounted as such. That is because China last year eased some of its direct import controls which may mean that perhaps as much as 40% of Chinese gold imports are currently going direct to the mainland, completely bypassing Hong Kong. Direct mainland gold imports built up decidedly in 2015 as seen from gold export statistics published by countries such as Switzerland, the UK and the U.S. But so saying, SGE withdrawals in week 20 (the week ending May 22nd) came to 43.4 tonnes, bringing the year to date total to 946 tonnes – around 20% up on the same week a year ago when the full year total came to 2,102.4 tonnes and also 8% higher than at the same time in the 2013 record year when the full year total was 2,197 tonnes and included a massive withdrawal week of around 117 tonnes in early May after the extraordinary COMEX gold take-down at the end of April that year. By contrast Hong Kong net gold exports to China have, according to Bloomberg, apparently dipped to 46.6 tonnes in April from 61.8 tonnes in March and 65.4 tonnes a year earlier. Much of the fall from April 2014 will have been due to more shipments bypassing Hong Kong, but the fall from the March 2015 figure seems to be something of an outlier given the still high levels of gold movements out of the SGE. 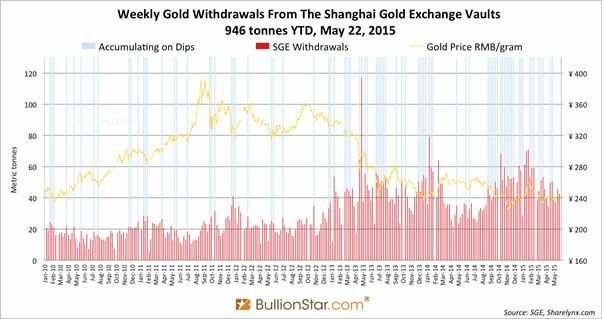 While there have been doubts expressed that SGE withdrawals are indeed equivalent to Chinese retail demand, it remains that all gold imported into China – either directly or via Hong Kong – together with China’s own gold production – around 460 tonnes last year – has to pass through the SGE. Some will aver that this thus represents total Chinese consumption, but the mainstream western analysts (such as CPM, GFMS and Metals Focus) come up with far lower consumption figures (indeed 1,000 tonnes lower or more), but do recognise that SGE gold withdrawal volumes need to be accounted for somehow, but are mostly rather vague on how the discrepancy between their figures and the SGE ones arise. Part of the discrepancy comes from a rigid interpretation of what actually comprises consumption, and there may also be an element of double counting in SGE figures with recycled gold coming back in and then out again, but this will be small. Now too figures are slightly muddied by movements in and out of the Exchange’s International section – the SGEI – but Koos Jansen, who perhaps follows the figures more closely than any other analyst, estimates the volume here so far this year as only distorting the overall figure by just under 13 tonnes. There is also an important element in gold apparently utilised within China in financial transactions and as collateral by the banks and other financial institutions, but this is highly unlikely to account for much of the differences. Gold analyst Philip Klapwijk (former executive chairman of GFMS), who nowadays has based himself in Hong Kong and is thus close to the action, states that there has been a substantial amount of gold shipped trans-border from mainland China into Hong Kong for remelting – mostly technically illegally – which could account for the big differences as it is generally assumed that China exports no gold. But given Hong Kong is treated statistically by the Chinese as a separate country this zero export number is obviously not the case, according to Klapwijk at least. He put the figures as around 1,200 tonnes last year and, with an element of round tripping likely involved, this could have distorted the Hong Kong to China net gold trade somewhat. In Q1 this year though, Klapwijk reckons the volumes of such ‘exports’ has dived dramatically as the Chinese authorities have been clamping down severely on this cross-border gold trade with Hong Kong. But if movements to Hong Kong have fallen as dramatically as Klapwijk reckons, yet SGE withdrawals are even up on last year, this gold has to be going somewhere on the mainland. How this will tie in with Chinese gold ‘consumption’ figures in the next quarterly analyses by the big gold consultancies is anybody’s guess. Our best guess is they will still see ‘consumption’ drop a little in line with current reports out of China of a fall-off in jewellery demand, which begs the question as to where all this excess gold coming out of the SGE is headed? Despite denials it has to be possible the excesses are somehow being absorbed by the PBoC – the Chinese Central Bank. Given the Chinese have a track record of hiding the PBoC’s true gold holdings in non-reportable accounts, this excess gold could be finding its way into similar accounts thus enabling the PBoC to stick to the position that it doesn’t buy gold from the SGE. As always there is a degree of opacity here which is hard to break through with the Chinese always playing their key economic cards close to their chest. Draw your own conclusions here – they are probably just as good as ours!